Let it be known far and wide: The market value for bigfoot footage is $100 per second. Shout it from the mountain tops. It's a fact ! The BFRO is willing to pay at least $100 per second for new and authentic footage of a bigfoot (i.e. clear footage in daylight or in headlights). If $100-per-second seems like too much to pay for bigfoot footage ... consider that most sightings last only a few seconds. And consider that very few people have observed a bigfoot in daylight, and at close range (less than 100 feet), for more than 30 minutes or so. Observations lasting more than a minute or two are exceedingly rare. That will not change. The supply of new, authentic bigfoot footage will never exceed the demand. Many people own both a cell phone and a small digital camera. The trend, however, is to carry only a cell phone and use it for unplanned photo-ops. Fortunately, cell-cams have improved drastically over the past few years. The quality of cell phone video footage today (the lastest devices) is leaps and bounds beyond the quality of cell phone videos of the past decade. The miniaturization of HD camera components has also spawned the development of a new camera category -- the inexpensive dashcam. Up until last year dashcams were only found in police cars, but a few manufacturers now offer HD dashcams in the $200 range. Vosonic (Taiwan) makes the best inexpensive dashcam. Wally says its the best cheap dashcam by far. As usual, he bought and tested a few different types. Vosonics record great color video footage in fairly dark conditions. You can actually see more things ahead of you on the road when looking through the small LCD monitor than you can see with your own eyes. The camera technology makes it appear brighter outside. Other types of inexpensive dashcams only show tailights and headlights at night on the open highway. There are bigfoots in some parts of most states in the US -- typically the parts of a state where there are loads of deer (the prey of bigfoots) in combination with rough terrain or very dense brush. Many people in the US and Canada spot bigfoots each year in certain areas. That will continue to happen for a long time. As good camera technology spreads through the population, many more people will be equipped to capture those fleeting observations with smooth, clear HD footage. Never feel afraid to videotape an encounter with a bigfoot. They are deathly afraid of humans, even human children. They will always keep a safe distance (20 feet or so) from a human (while the human is awake and alert), even if they are trying to intimidate the human(s) into leaving the area. If they get pushy about it, they'll make scary noises and throw rocks from a distance, but they will strenuously avoid any direct physical contact, as if their life depends on it. Pointing a camera at one as it runs away will not change that. You have nothing to worry about with a camera. There are some historical accounts of bigfoots attacking humans who shot guns at them, so don't ever do that, even to scare one away. The historical accounts suggest the retaliation attack happened several hours after the initial shooting, so don't even shoot at one off in the distance. If you truly feel threatened you only need to shout loudly and/or shine bright lights around in the trees. The bigfoot may continue to harass you with disturbing sounds from a distance, but they'll hang back far out of view when they do that. Not Interested in Fake Footage! The Los Angeles Times web site provides a link to the video from North Carolina. Yes, it's fake footage. It's a guy in a costume. We're only interested in footage of real bigfoots. 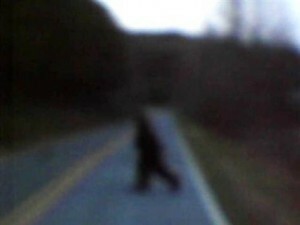 In other words, a dude in a furry costume walking across a country highway ... is not a bigfoot. Just as shark experts can quickly distinguish video of a real shark from video of a toy shark, we can quickly tell the difference between a guy in a bigfoot costume and a real bigfoot. This recent clip from Shelby, North Carolina is a guy in a costume. No doubt about it. The costume is so bad that the cameraman had to blur the picture. YouTube is chock full of hillbilly masterpieces like this. This Shelby, NC clip is only notable because it quickly made the search term "Bigfoot video" the top trending item on Yahoo for much of the day on March 24, 2011. The new 12MP Samsung cell phone with optical zoom records impressive video. See video below. 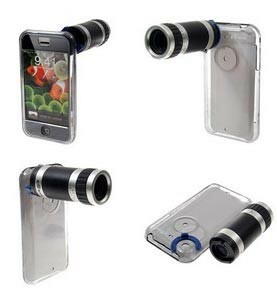 The lastest accessory telephoto lenses for iPhones need to be snapped on to a special hard case, but they do significantly extend the visual range of iPhone cameras. Illustration showing how a Vosonic 6330 dashcam attaches to a car visor. It records clear HD video automatically while the car is in motion, and impressively clear footage at night. The night footage is brighter than what you can see with the naked eye. Thus if you see a bigfoot in your headlights then this unit will capture very clear and stable HD footage of whatever you saw. dashcams show a much darker image -- only the lights stand out. Vosonic 6330 dashcams record hours of audio and video onto SD cards. They will power up automatically when the vehicle is started and record continuously until the engine is turned off. Widespread usage of dashcams will reduce case loads in courts by drastically reducing (or at least drastically simplifying) lawsuits related to traffic accidents. At present the truth about what happened in a traffic accident can only be determined with witness testimony and experts and residual evidence found at the scene ... just like with bigfoot sightings, as a matter of fact. HD dashcam technology will inevitably bring fact-finders to the truth faster and more confidently in both scenarios. If you obtain clear bigfoot video footage during a BFRO expedition, the market value will be at least $200 per second. That's what we would pay for it. Reliable measurements of the surroundings, and systematic comparartive video clips can be obtained immediately afterward, with the help of several knowledgeable people and witness bystanders. Comparative clips can be made using the same camera, from exactly the same camera angle. Also, the surrrounding foliage in the comparitive video is exactly the same as in the original video. The changing foliage pattern is usually the most difficult variable to contend with long after the fact. A group of experienced bigfoot researchers being present and voluntarily gathering all the useful data immediately afterward ... makes things much, much easier for us when trying to ascertain accurate biometric measurements of the figure.